Here is my entry for this week´s challenge on http://gothicarches.ning.com/ Stamp is from Zettiology, stamped on metallic foil and embossed with an embossing pen. 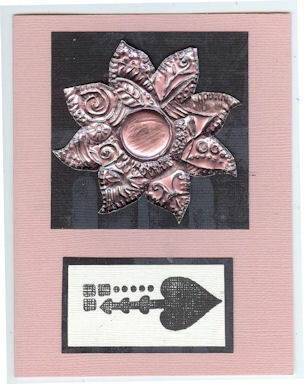 I stamped with Stazon on pink metallic foil and embossed the flower stamp (Michael Strong) with an embossing pen and an embossing wheel. The second stamp is from Club Scrap.